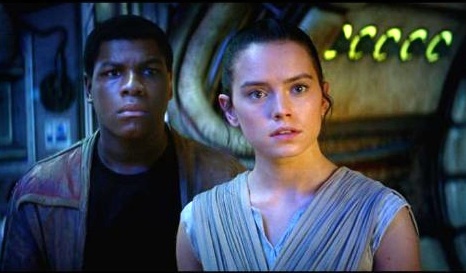 As Han Solo himself puts it in the everything-old-is-wonderfully-new-again "Star Wars: The Force Awakens," "The girl knows her stuff." The female in question is new character Rey, a desert-planet salvage trader turned resistance fighter played with smarts, toughness and likeable determination by Daisy Ridley. Of all the familiar and fresh faces in this skillfully revitalized seventh "Star Wars" installment, the resourceful Rey emerges as the unexpected primary protagonist. Ridley's not the only appealing addition this time around, however. Fellow newcomer John Boyega is Stormtrooper FN-2187, aka the slightly goofy Finn, who decides on his first combat mission that the whole "kill them all" thing just isn't for him. Oscar Isaac is rebel pilot Poe Dameron, who gets plenty of cockpit time flying various air-and-spacecraft. Adam Driver is the vaguely Snape-ish Darth Vader stand-in Kylo Ren, with the same penchant for voice synthesizer, black attire and general evil-doing. For those who have regarded the previous half-dozen "Star Wars" movies as little more than feature-length toy commercials (I include myself), it may come as a shock to realize that even the new inverted-bowl-on-a-beach-ball droid BB-8 is more than just a merchandise mover. Rolling into the R2-D2 role with the same beep-boop language and childlike innocence, BB-8 is as funny and charming as Jar Jar Binks wasn't. As for the returning cast members from the original trilogy, Harrison Ford's still gruffly roguish Han Solo is back in the smuggling business with Chewbacca, even if he's running from unhappy associates a little more awkwardly these days. Carrie Fisher's Princess Leia is now the resistance's matronly General Organa (and, as Han notes, has "changed her hair"). Mark Hamill's Luke Skywalker, meanwhile, is the missing-in-action object of a galaxy-wide search by both the good and bad guys. Director J.J. Abrams (who co-wrote the screenplay with Lawrence Kasdan and Michael Arndt) manages to make the movie much more satisfying than a mere by-the-numbers retread, even if many scenes here are so familiar they often play like an alternate-universe do-over of events we've seen before. Yes, you will hear again the immortal lines "I have a bad feeling about this" and "May the force be with you." You will see a hit-the-target bombing run on a bigger and badder equivalent of the Death Star, and lots of odd characters populating a different cantina. There also are the usual multitudes of videogame-style laser-gunned and exploded-ship casualties. Two new plot developments are so major, however, that they qualify as extremely big deals in the history of the franchise. The bad news is that blabbermouths probably will ruin both surprises long before you buy a ticket. The good news is that the movie still is worth the ride, even if your jaw won't drop quite so far when those would-be astonishing events occur. That's because the film is so entertaining and fast-moving that it's irresistible fun even for those hard-to-please snobs who were thoroughly unimpressed by the original trilogy, and who absolutely loathed the three more recent installments. (Again, I include myself). Abrams has worked the same magic on "Star Wars" as the trick he pulled off with his 2009 "Star Trek" re-imagining, by remaining faithful to the core essentials of each franchise while cleverly tweaking, upgrading and innovating where needed. In fact, it's hard not to imagine George Lucas watching this movie unfold with the same admiration Han Solo wordlessly expresses when observing the eagerly enthusiastic Rey as she co-pilots his beloved Millennium Falcon.